「ラ・ガウチェ・ディバイン」は、バルセロナでの新しいショッピングの在り方を提案している。バリオ・ゴチカの中心にあるこのブティックは、La gauche divine represents a new shopping concept in Barcelona. 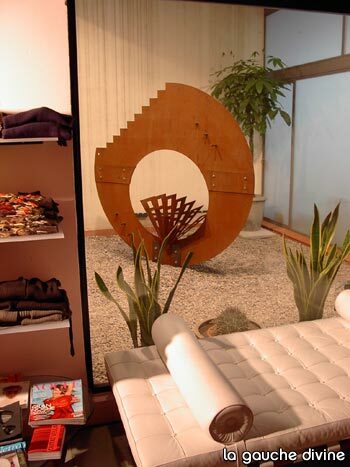 Located in the heart of the barrio gotico, this boutique presents Spanish and European designers for men and women, vintage couture and exclusive bags and shoes in a space where you can admire a new art exposition each month and have a drink while you fit in one of their original clothes. Twice a year they organize catwalks and invite their clients to see the collections they will be able to purchase later in the shop. Located between Las Ramblas and Paseo Colon; this new boutique feeds itself from the history, modernism and the commercial tradition of this area. The shop is located in front of a little place with palm trees. It is accessed through a covered passage dated from the XIX century. 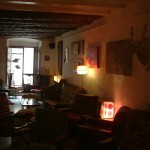 Once a month la gauche divine exposes art collections from young artists, from paintings and photographs to sculptures. They invite their clients to the vernissage where they can have a drink and a good conversation with the artist and the other people who attend to the expo.